Year: 1957. Running time: 85 minutes. Black and white. Directed by Joseph Losey. Starring Michael Redgrave, Leo McKern, Joan Plowright, Peter Cushing. Aspect ratio: 1.33:1. English. Mono. DVD release by Home Vision Entertainment. Year: 1982. Running time: 104 minutes. Color. Directed by Joseph Losey. Starring Isabelle Huppert, Jeanne Moreau, and Jean-Pierre Cassel. Aspect ratio: 1.66:1. In French with optional English subtitles. Mono. DVD release by Home Vision Entertainment. Year: 1976. Running time: 123 minutes. Color. Directed by Joseph Losey. Starring Alain Delon and Jeanne Moreau. Aspect ratio: 1.66:1. In French with optional English subtitles. Mono. DVD release by Home Vision Entertainment. Joseph Losey's biography is unusual: while shooting a film in Italy, he was summoned to testify in front of the Anti-American Activities Committee. Like some other filmmakers, he chose to seek refuge in England  and he never returned to America. He made a total of 39 movies  in the USA, England, and France  and a few of them became art-house hits. Even so, I would hesitate calling him an auteur, insofar as his most famous films were a rather literal film version of a hit play (Harold Pinter's The Servant) and an equally literal adaptation of a highly-respected novel (L.P.Hartley's The Go-Between, with Pinter contributing the screenplay). Much of the rest of his oeuvre, though employing the most stellar filmmaking talent available at the time, is easily forgettable. That begs the question: what's the big deal here? Perhaps, instead of traipsing from London to Cannes and making "art" movies that few people paid to see, he belonged in the Hollywood system, being told by a crude studio exec what to do. I have an ugly little suspicion that both Losey's access to British and Euro film talent (Dirk Bogarde and Jeanne Moreau were regulars), extraordinary for a director of any stature, and subsequent acclaim for his work stem from the chronically leftist European politics: surely a refugee from the likes of Joe McCarthy had to be (and if not, be made into) a great director. Yet the reality had to be a little more complicated, veering between his hallowed art-house status and simple political comradeship. Viewers can see this in Losey's three films, recently released on DVD by Home Vision Entertainment. 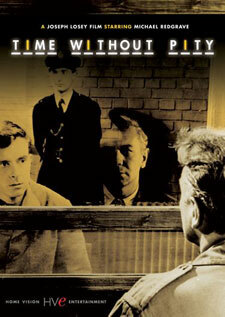 The oldest of the three, Time without Pity (1957), is a standard-issue noir, neither better nor worse than other films of the period: a father has 24 hours to save his son from execution for a frame-up murder. As such, it is mainly of interest to noir aficionados; however, the roles of the alcoholic father and the evil murderer are played with utter abandon by Michael Redgrave (no one can play alcoholics like the Brits) and Leo McKern, respectively. For whatever reason actors agreed to be in Losey's films, he made them shine. Dirk Bogarde played in forty-something forgettable British films before Losey made him into an international star in The Servant and Accident, after which it was a natural transition to The Damned and The Night Porter. 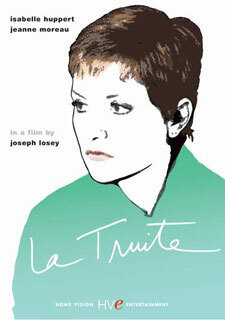 Also among the three films released is Losey's next-to-last, La Truite ("The Trout"), made in France in 1982. Whatever kudos you hear about it from other critics, there is really not much there. Luxuriously shot villas and nightclubs cannot compensate for a sloppily told story (where is Pinter when you need him?). Even in 1982, a story of a young girl determined to rise from a humble station through exploiting men is an old chestnut. So she grew up on a trout farm and identifies with this slick aggressive fish  and? Ah, but the spirited Isabelle Huppert plays Eve, and she sweeps through bowling lanes and ritzy Japanese hotels with an insouciance that is something to behold. And she is beautifully supported by that lioness in winter Jeanne Moreau as someone who can see right through her. Granted, Moreau can play parts like this in her sleep, but it is still a pleasure to watch. And do not miss Alexis Smith in a cameo as an aging American gold-digger who mangles and crumbles her French as if it were yesterday's baguette. Finally, there's Mr. Klein (1976), a film that some consider among Losey's best, and I agree  definitely the best I have seen. The story is intriguing, a Kafka Lite, which is not meant pejoratively  real Kafka doesn't do so well on screen. In WWII Paris, Robert Klein (Alain Delon, who also produced the film) is an art dealer who buys art works from the Jews trying to escape. Suddenly, he finds a Jewish community paper on his doorstep  he seems to be on the subscription list, which in '42 is a good reason to be worried. There seems to be another Robert Klein, a Jew who may be with the Resistance and who appears to be gone into hiding and to be using Delon's character to divert attention from himself. 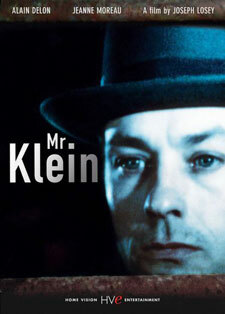 Gradually, Delon's Klein is becoming obsessed with his double, drawing the police's attention and unintentionally persuading them he is the real Klein the Jew. As usual, Losey gets a stellar performance out of his lead: this is one role where Delon smartly plays off his tremendous charisma (few people can wear a hat with as much panache) to create one of his most nuanced performances. Step by step, this arrogant art dealer unravels, as his internal emptiness renders him helpless between the Scylla of police and Charybdis of the other Klein. Losey does a great job framing him in the context of an occupied city. In Losey's France, there is no one to decorate with a Legion d'Honneur ribbon; there is only the French police, acting with Teutonic efficiency to round up the Jews, and sharks like Klein himself and his lawyer, taking advantage of the persecuted. The final scene, where Delon, suicidally deranged, follows the other Klein  or perhaps his phantom  into the maw of concentration-camp-bound railroad cars, leaves you breathless. Even now, after Schindler's List and The Pianist, Losey's small peek into the Holocaust holds up pretty well. Once in a while, the old man delivered. Time Without Pity, La Truite, and Mr. Klein are now available on DVD from Home Vision Entertainment in new digital transfers. Suggested retail price: $19.95 each. For more information, check out the Home Vision Entertainment Web site.